2. I’m hopping on the bandwagon with people who turn their kid’s closets into reading/studying nooks. 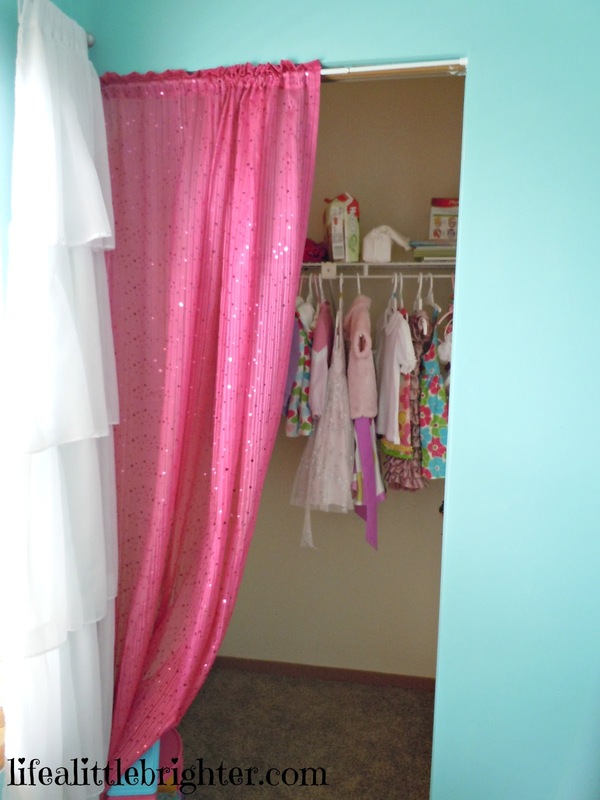 My daughter’s bedroom is a decent size (13×10′) but her closet is TINY. I suppose maybe that word should be smaller, not all caps? Anyways, we have all her clothes in an armoire, which frees up her closet. We’re taking my old desk from my parents (upcycling again!) and closing that section off with a sparkly, pink curtain. My hubby even promised to build some sort of loft in the top part where she can store stuff or climb up up and away:) I would have loved a spot like that as a kid. More details to come as we finish the project. So far we just have a curtain. 3. Discovered this lip gloss two years ago…. Been meaning to mention it on H54F. It stays like mad. In fact, it’s the only thing (chapstick, lipstick, gloss) that stays on & protects my lips in the winter. If I go a couple of days without putting it on, my lips totally dry out. Nothing, even the fancy lip treatments, does the same for me. This made me laugh so hard I had to pause the video so I wouldn’t miss any of the jokes. Then I had to watch 5,000 other Jim Gaffigan videos, of course. 5. I’ve been using this weekly organizer from i heart organizing. It’s cute & simplifies my to-do list. Plus, it’s free! Happy Friday!